Four tips to get your child reading more often. Not the finest use of books, but it’s a start! In the age of flashing screens, computer games and constant distraction, making sure a child has a good attitude towards reading can sometimes be difficult. Some children seem to be totally against the idea of reading, believing it to be dull and associating books with work. Other children, including myself when I was a child, love reading once they get into a book, but are often reluctant to take the first step in choosing new reading material. What we know is that children reading as regularly as possible helps social and educational development in a plethora of ways. We also know that most parents want to encourage their children to read more, but often have difficulty in motivating them to pick up another book. 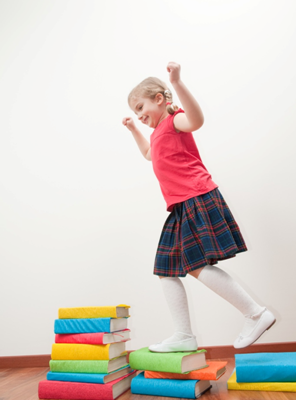 Luckily, we at Genie Tutors have some great tips to get children reading more often. Use real life activities to reinforce what a child has read. If a child needs a push to read more often, bringing literary references to life can be a great way to encourage children to explore the world of fiction further. One of our tutors talks about taking his children ‘Gruffalo hunting’, where a walk in the countryside suddenly turns into living the adventure of one of their favourite books. This same walk in the park can easily become a bear hunt, fuelled by a child’s imagination. If a child has a passion for helping in the kitchen, making sauces can quickly be the subject of a ‘potions class’ at Hogwarts. A weekend away camping can turn the stressful act of putting up a tent into a Robinson Crusoe inspired survival experience. Bringing these literary memories off the page and into real life is a great way for children to become more engaged with what they read. The children will create positive memories associated with books they have read, and this will push them to choose to read more books in the future. Take an active role in their reading. In order to be able to commit to the suggestion made above, a parent needs to already be actively involved. Instead of tasking a child with an hour’s silent reading, if parents show interest in reading and spend time with their child, this is likely to enhance the child’s enjoyment of the text. As adults, we often associate reading with privacy and silence, but a child might need quite the opposite to experience the magic of a book. A lot of children’s literature relies on the cadence and flow of the words to bring it to life, so hearing a parent read out loud, even at ages when children can comfortably read by themselves, is often a great way to develop interest in a story. Make book purchases specific to a child’s interests. While the internet may well contribute to a child’s reluctance to read, it can also be used advantageously. The internet gives everyone access to a mind-boggling amount of literature, so there’s no excuse for not buying a hesitant reader the perfect book that will interest them. If you have a football-mad son, you no longer have to settle for walking into a book shop and buying the first football-related title you can find. Use the internet to find a book or magazine with, for example, their favourite team or player on the front cover, so that they are more likely to be excited about the purchase. Allowing a child to choose a book also increases the chances that they will read the book once it is purchased, and it is certainly a less intimidating experience for a reluctant reader than being dragged to the library! Reward your child’s efforts regularly. 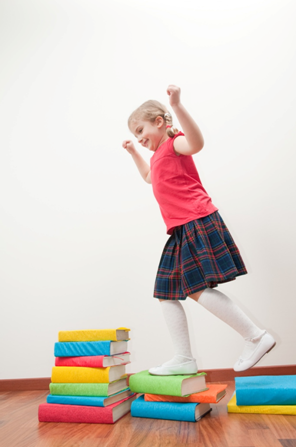 Finally, it is vital to reward children for their efforts when they try to read more often. It is important to do this while the child is still reading the book, rather than at the end of the book. This means that the reward is for the act of reading, not for finishing a book. The treat could even be related to the book, such as buying the DVD to see how the child’s impression of the book differs from the film, or doing a similar activity to those suggested in the first tip. What is important, is demonstrating the value in reading and giving reading positive associations. Hopefully, all a child will want is another book!